Each time you make a reservation through this website, your reservation is made directly with Kyveli Suites. As such, you are guaranteed the lowest possible rate, unlike reservations made through third party systems (whose prices include the given platform’s commission). 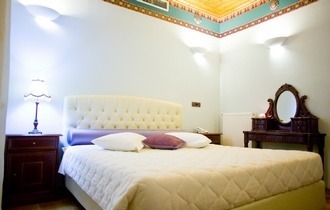 To view rates, availability and make an online reservation directly with Kyveli Suites click here! 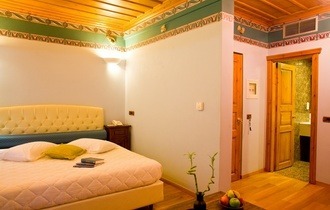 "Kyveli Suites" is located in the centre of the traditional dwellings, exactly behind the harbour of Nafplio. 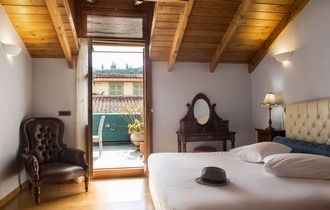 It consists of two beautifully restored buildings with a 150 year-old history. These buildings were completely renovated with respect for our cultural heritage and were transformed into 4 star luxury suites. "Kyvveli Suites" offers its guests 9 suites that are different in terms of colour, have their own names and can accommodate up to 4 people. All the suites are comfortable, uniquely decorated and fully equipped. The vibrant colours, oak floors, Swedish pine ceilings, the comfortable traditional furnishings, the traditional balconies in combination with the atmosphere of the old city of Nafplio assure you an unforgettable stay. Claiming a little bit of the ethereal beauty and peace of Kyveli, we may stimulate your need for introspection and relaxation far from your daily routine, in an environment envisaged and created especially for you, arising from a strong intrinsic wish for a stay that will be truly enjoyable! For reservations made by telphone or email enquiry, additional discounts apply!